CONCORD, N.H. — The New Hampshire Fish and Game Department has set final season dates and bag limits for the 2013-2014 waterfowl hunting season, after considering comments from sportsmen at the recent public meeting. New Hampshire’s 2013-2014 waterfowl season is very much like last year’s. The overall duck season is 60 days, with a bag limit of 6 birds daily; and the Canada goose season is 60 days, with 2 birds in the daily bag. One significant change in this year’s regulations is that all possession limits for ducks, geese and other migratory game birds are 3 times the daily bag limit, rather than 2 times the bag limit. * The Northern Zone waterfowl season opens on October 2 and runs straight through November 30, 2013. * The Inland Zone waterfowl season opens on October 2 and runs through November 3; then reopens November 19 through December 15, 2013. * The Coastal Zone waterfowl season opens on October 3 and runs through October 14 (Columbus Day); then reopens November 19 through January 5, 2014. To hunt waterfowl in New Hampshire, you must have a New Hampshire hunting license, a New Hampshire Migratory Waterfowl License and a federal duck stamp. You also are required by federal law to register for the National Migratory Bird Harvest Information Program (HIP). Separate HIP permits are needed in each state you hunt. Licensed hunters should call 1-800-207-6183, or go to http://www.huntnh.com and click on “Buy a License Online”; you can receive a permit number at this site (there is no charge). Write the permit number on your hunting license. Each year, a random selection of hunters is asked to complete a voluntary harvest survey. Hunters are asked to report all banded birds using the toll-free phone number, 1-800-327-BAND or go to http://www.reportband.gov. 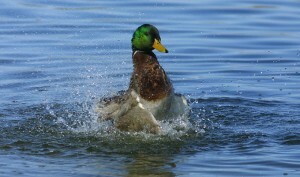 For more information on waterfowl hunting in New Hampshire, visit http://www.huntnh.com/Hunting/Hunt_species/hunt_waterfowl.htm.